When you combine two of the best foods in the world: delicious cheese and doughy bread! With their philosophy of “nothing works better than Cheese & Bread.” Melbourne’s brand new pop-up container cafe features a rotating menu of classic gourmet toasties that will leave you coming back for more! I’m Sally, the Marketing Manager at Cheese & Bread. I’ve been a part of this business from the ground up, essentially I’ve had a hand in the whole kit and caboodle – menu development, staffing, branding and management. How did the idea for Cheese and Bread come about? The idea was developed within our team at the Australian Food Vendors Group (owners of the amazing Food Truck Park in Preston. It’s owned by Frank Rusitovski & Dean Trpeski, local friends who together have 50 years of experience in the Melbourne catering and food truck industry. 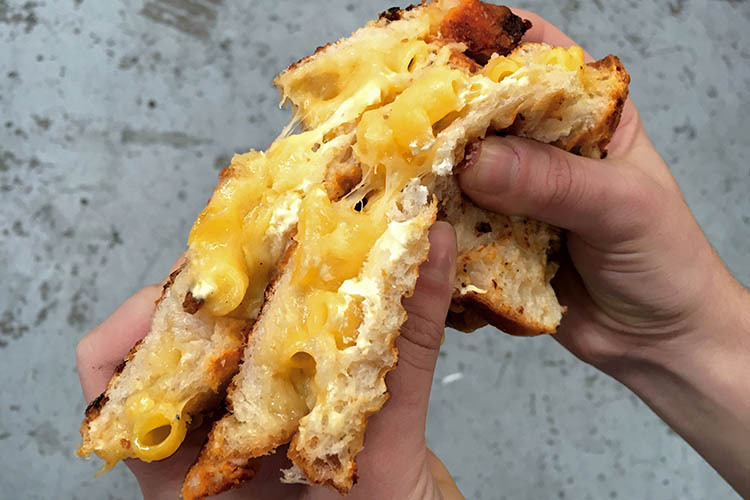 Wanting to create gourmet toasties that flip home cooked comfort food on its head, the pair set out to craft a menu that is undeniably tasty and at times controversial. As a team we saw opportunity to utilise the space at the Park during the week and wanted to offer the community something that would cater to the locals, most of whom are either in hospitality or trades and services. Cheese & Bread was born from the idea that people needed a breakfast option they could take away, something that was tasty, easy to order and eat and would leave you wanting more. What’s the best thing about having a business in Preston? People in Preston are really proud of their area, which we love because they are always such great supporters of local business. Whenever we have something new on our menu the community is supportive. Cheese & Bread has been so successful that we are looking at expanding into other great community suburbs within Melbourne. In your opinion, what makes the ultimate toastie? There are a few things – there’s definitely an art to it! We use an house blend of cheese – it’s not just one it’s three. We also do not go lightly on the filling. Who’d be excited about something if they couldn’t indulge in it? The ultimate toasties also has a LOT of flavour – we pack ours with simple but delicious combinations of good, fresh ingredients that are distinct from the other items on the menu. Oh and finally, a good dosing of butter on the outside never hurts. 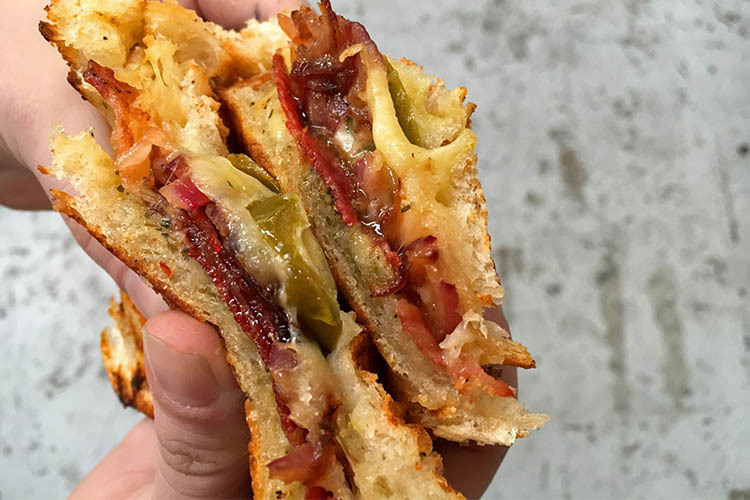 You’ve raised the bar considerably from the humble white bread, ham and kraft cheese toastie. Where does your inspiration come from for these menu items? The ideas can come out of nowhere…. We’re a bunch of cheese lovers so as long as we can make something awesome we’re happy! A lot of the inspiration can come from the names of characters from movies and cartoons, like our Lenny and Carl – adopted from the beloved Simpsons. Generally, Cheese & Bread is about the fact you can have two ingredients and make something amazing. We also listen to what people ask of us – either on social media or what our regulars keep requesting. If you think something is great – tell us! What would you consider the most requested item on your menu? A classic Mario & Luigi is potentially our top pick – a combination of house blend cheese, pesto and tomato. Tasty and delicious – and not too overwhelming. Is there an art to the assembly? We actually have guidelines for how each toastie needs to be stacked. We’re not revealing everything but what we will say is you can’t skim on the cheese. More is more. When Cheese & Bread closes, where is the team heading to relax? During the week we finish at 2pm and often go next door to Dexter. It’s a restaurant and bar that offers takeaway pizza. Along with Cheese & Bread and the broader Food Truck Park they have helped us bring the Preston end of High Street to life. Design is so crucial to the café experience these days – how big of a part do you think aesthetic plays in being a successful eatery? How do you manage that with your pop-up container? It is crucial and it’s more challenging being an outside premise. We’re in a converted container so for us it’s about making our space clean and inviting. That being said, our container is bright yellow – just like a block of cheese so you really can’t miss us! As we’re not ‘streetside’ our customers do need to come into the Food Truck Park to order from us which can be a bit more like a café experience where you’re removed from the hustle of High Street and can take a breath before you take a bite.